Two youths carrying spears and ambatch shields rush past in the foreground, one wearing thiau armrings on his left arm, with numerous other youths gathered nearby next to a windbreak near a cattle byre (luak) at a cattle camp. Morton, Chris. 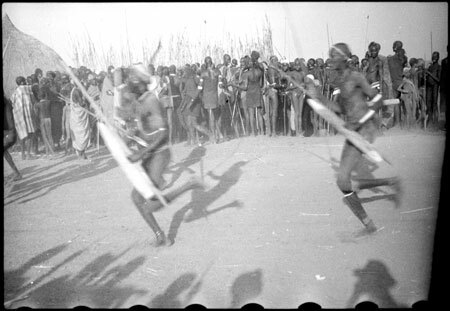 "Nuer dancing" Southern Sudan Project (in development). 03 Jan. 2006. Pitt Rivers Museum. <http://southernsudan.prm.ox.ac.uk/details/2004.130.32937.1/>.